Grand Central Publishing, 9780446409490, 336pp. 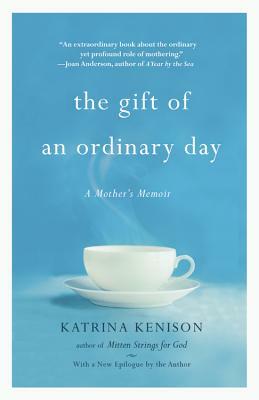 The Gift of an Ordinary Day is an intimate memoir of a family in transition-boys becoming teenagers, careers ending and new ones opening up, an attempt to find a deeper sense of place, and a slower pace, in a small New England town. It is a story of mid-life longings and discoveries, of lessons learned in the search for home and a new sense of purpose, and the bittersweet intensity of life with teenagers--holding on, letting go. Poised on the threshold between family life as she's always known it and her older son's departure for college, Kenison is surprised to find that the times she treasures most are the ordinary, unremarkable moments of everyday life, the very moments that she once took for granted, or rushed right through without noticing at all. The relationships, hopes, and dreams that Kenison illuminates will touch women's hearts, and her words will inspire mothers everywhere as they try to make peace with the inevitable changes in store. Katrina Kenison is the author of Mitten Strings for God: Reflections for Mothers in a Hurry (Warner Books, 2000). She has appeared on Oprah and other shows. Her writing has appeared in O, Real Simple, Family Circle, Redbook and other publications. From 1990 until 2006, Kenison was the series editor of The Best American Short Stories, published annually by Houghton Mifflin. She co-edited, with John Updike, The Best American Short Stories of the Century (Houghton Mifflin, 2000). She wrote, with Rolf Gates, Meditations from the Mat: Daily Reflections on the Path of Yoga (Random House, 2002).